With winter break around the corner and the giving spirit in full swing, a number of clubs and organizations at CCHS are doing their part to help make the holidays brighter for many who desperately need it this holiday season. For the past 24 years, CCHS has reached out to the Nancy J. Cotterman Sexual Assault Treatment Center in Ft. Lauderdale. The treatment center provides a safe environment for victims of sexual assault and family members. Classes who wished to participate were assigned a holiday “wish list” of a child who had been sexually abused. Students were responsible for bringing in items on the child’s wish list or donations. Christopher Hinely’s social studies classes paired up with Charles Cardinale’s classes and Darryl Schultz’s classes to collect gifts for a seven-year-old boy named Amilio. They were able to purchase Amilio a brand new scooter and a video game remote control, as well as a number of other gifts on his holiday list. “These kids have gone through very traumatic experiences, so anything we can do to brighten up their holidays is certainly well worth it,” Hinely said. Once all the gifts were collected, SGA officers and volunteers got together to wrap them all after school. 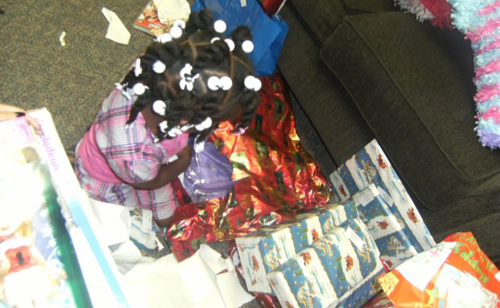 Last week, many SGA members threw a holiday party at the center and distributed the gifts to the children. “All the members of SGA and SGA volunteers were a great help, putting their time into walking around the school and bringing down the presents from the teachers to room 130, where they were then labeled, wrapped, and labeled again,” SGA Vice President David Riusech said. Luisa Villagomez, a family therapist at the Sexual Assault Treatment Center says that the holiday party is important for these children because it helps create positive memories after having experienced so much tragedy and trauma in their lives. “This party helps the children see that there is goodness out there in the world, and that they can be recipients of good things,” Villagomez said. While many people take receiving holiday gifts for granted, for these children it is something that they will always remember. CCHS’s Florida Future Educator’s of America (FFEA) has also gotten in the spirit of giving by holding a toy drive for the EASE (Emergency Assistance Service Effort) Foundation, a nonprofit organization which provides residents with emergency relief, as well as reaching out to the homeless by providing them with food, clothing and other supplies. After a Davie fire wiped out a great portion of the facility last month, including a storeroom packed with food and toys for the holidays, the EASE foundation was left with very little if anything to distribute to over 200 families this season. Thankfully, FFEA came to the rescue by collecting more than 60 toys. Cooper’s FFEA president Aysha Awal, said the effort at CCHS is part of a national FFEA initiative to collect hundreds of toys for needy children during the holidays. “We don’t realize how fortunate we are until we think of all the kids who don’t receive any presents during the holiday season,” Awal said. As part of their commitment to service, the TOMS Club is visiting the Ann Storck Center, a nonprofit organization that serves individuals with developmental disabilities, including epilepsy, Down Syndrome and autism. The TOMS Club is going to decorate Christmas cookies with the children. After visiting the Ann Storck Center last year and learning about the organization, TOMS Club founder senior Ashley Saul thought it would be a great place for the TOMS Club to give back this month.